Quality: A sweet relish, not a salty dill pickle relish. 2. Prepare cucumbers and peppers by first washing them well. After washing the cucumbers, slice a thin piece from both the stem and blossom ends and discard. Cut into about 1-inch pieces and then chop in a food processor (using about 3 pulses on “chop”) to yield about ¼-inch or slightly larger pieces. Measure 12 cups of the chopped cucumber. 3. After washing the peppers, remove the stem, seeds and white membranes. Cut into about 1-inch pieces or slices and then chop in a food processor (using about 3 pulses on “chop”) to yield about ¼-inch or slightly larger pieces. Measure 3 cups of the chopped pepper. 4. Remove the skin from onions. Wash well and chop into about ¼-inch cubes, or process to size in a food processor as for peppers. Measure 1 cup of the chopped onion. 5. 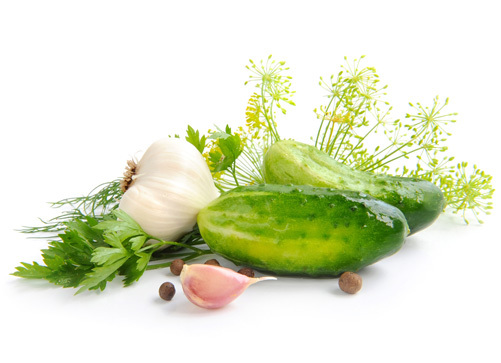 Combine measured chopped cucumber, pepper and onion with salt, ice and the 8 cups water in a large bowl or saucepot. Cover; let stand 3 to 4 hours in refrigerator. Drain; rinse thoroughly with ice cold water and drain well again through a cheesecloth-lined strainer (until no more water drips through, about 15 to 20 minutes). 6. Heat vinegar, sugar, 1 cup water, and remaining ingredients in a stockpot while stirring, until sugar dissolves. Add drained, chopped vegetables, and bring to a boil. Reduce heat and simmer 10 minutes. 7. Fill hot relish into clean, hot pint jars leaving ½-inch headspace. Remove air bubbles and adjust headspace if needed. Make sure liquid covers the top of the food pieces. Wipe rims of jars with a dampened, clean paper towel; apply two-piece metal canning lids.